Since he's my little taekwondo star, of course. Actually, they both are, but Faith wanted something else for lunch. We spent the weekend in Louisiana for the kids to compete at a TKD tournament. Faith came home with first in sparring, first in patterns for her division (she's 8 and an advanced blue belt). Ben won first in sparring, second in patterns for his division (he's 5 and a blue belt). Shaun didn't compete this time, just watched/coached the kiddos. For lunch today, Ben had a cheese quesadilla, topped with cheese stars. 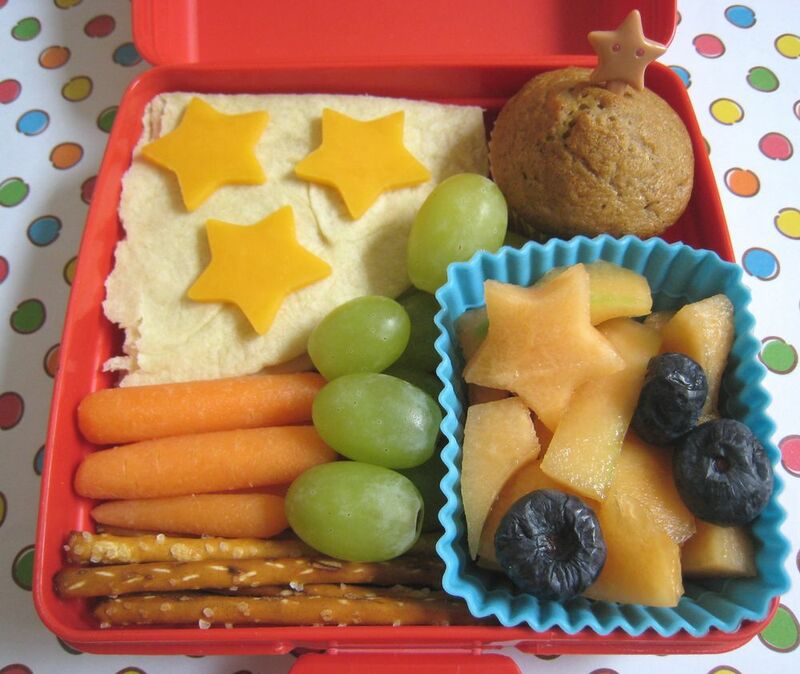 He had a banana muffin (also with a star pick), cantaloupe with a few star shapes (and a few frozen blueberries from another project), grapes, pretzels and carrots as filler. Back to life tonight, kids have TKD class, again! Last day to enter the Yogi Bear dvd giveaway, if you haven't already done so, just leave a comment on the review blog post. Wow! Way to go Ben! I love the stars...perfect for ben! This is the second star bento I've seen today...must be something in the air. Oh, congrats to Faith too! Woohoo!